Vertical Packed Bed Scrubbers provide one of the most efficient removals of acid gases, odors and vapor fumes by using a vertical counter flow design. The contaminated gas flows up while recirculating liquid sprays downward into the packed bed. The gases are absorbed by the scrubber solution solubility level and by chemical reaction. Vertical Packed Bed Scrubbers are commonly used in application removals of odors such as Amines, Ammonia, Diamines, H2S, Mercaptans, Organic Sulfides and Skatole. Indusco Environmental Services, Inc. vertical packed bed scrubbers are designed for applications requiring the removal of a wide range of various types of contaminants from various types of gas streams. Typical applications for contaminant removal include noxious or toxic fumes from all types of chemical process operations or odorous fumes from water/sewage treatment and compost facilities. 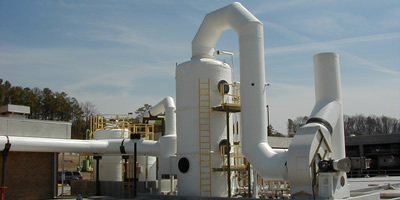 Depending upon each application, scrubbers can be manufactured from metal materials, fiberglass reinforced plastic (FRP), thermoplastics, or dual-laminates. 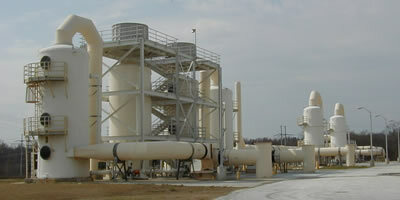 Each scrubber application is individually designed and engineered for each unique requirement. Many scrubber units are used to help companies comply with emission control for EPA regulations or to preserve the quality of the environment for workers and the community. To remove the unwanted elements, contaminated air is passed through the scrubber using either positive or negative pressure, created from a fan either upstream or downstream from the scrubber unit. The gas stream enters the scrubber unit near the bottom, travels up through the packed bed section and is vigorously exposed to the scrubber solution through a demister assembly. It is discharged either to the atmosphere or routed back through the original process. In order to provide the most economical solution for our clients scrubber needs we take into account the volume of gas to be treated, type and concentration of contaminants, and the required discharge limits, in determining the best solution for your needs. Indusco Environmental engineers will work closely with you to design the system that will best fit your needs.